Effective January 1, 2013, three of the five census tracts within the City of Waynesboro have been designated HUB Zones. 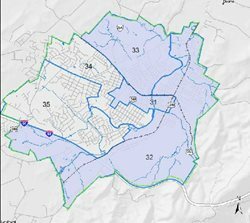 The blue shaded area in the map at right, shows the three census tracts in Waynesboro that have been designated HUB Zones. To verifiy your business address qualifies, please visit the SBA – HUB Zone Map. A Historically Underutilized Business Zone, is a geographical area – either a county, census tract, former military base as part of BRAC, or Indian Reservation. For a county or census tract, the US Department of Housing and Urban Development (HUD) makes a determination using census and other data: the area must have a certain level of poverty (based on household income or poverty rate). The US Small Business Administration (SBA) uses information as determined by HUD to designate HUB Zones. This designation is not permanent – it can change with new census data. If a business is located within a HUB Zone, and meets other criteria, they can become HUB Zone certified and receive certain benefits. Reports to the Congress on the program’s impact on employment and investment in HUB Zone areas. The federal government has a goal of awarding 3% of all dollars for federal prime contracts to HUB Zone-certified small business concerns. Any business meeting the qualifications below (www.sba.gov/contracting/government-contracting-programs/hubzone-program/understanding-hubzone-program) can apply to be HUB Zone Certified. At least 35% of its employees must reside in a HUB Zone. Reside means to live in a primary residence at a place for at lease 180 days, or as a currently registered voter, and with intent to live there indefinitely. To apply, a business needs to complete an online application at: www.sba.gov/contracting/government-contracting-programs/hubzone-program/applying-hubzone-program. An active up-to-date Dun and Bradstreet profile and DUNS number that represents the business for which you are seeking HUB Zone Program certification, recertification, program examination, decertification, etc. An active SAM profile for each of the businesses location(s). A business is identified using your Employer Identification (EIN). Learn about and register with SAM. Each business location (DUNS Number) must have a primary NAICS (North American Industry Classification System).